J.Tom Morgan is author of the popular book for teenagers, Ignorance Is No Defense, A Teenager's Guide to Georgia Law, published by Westchester Legal Press (2007, 2009, 2013, 2016). He is co-author with constitutional law scholar Wilson Parker of Ignorance Is No Defense, A College Student's Guide to North Carolina Law, published by Westchester Legal Press (2010). He has also written a number of articles on issues affecting young people. Throughout his career, J.Tom Morgan has been recognized for his skills in the courtroom and his advocacy for children. 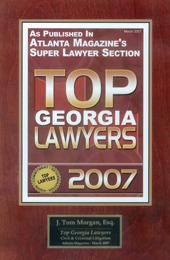 J.Tom Morgan was awarded the 2007 "Top Georgia Lawyers" Award for "Civil & Criminal Litigation" by Atlanta Magazine.